Do you geek culture? This month, the library showcases programming ranging from beautiful bronzes from Benin to a look back at ancient Florida. Children can enjoy the antics of Red Riding Hood and the lively storytelling of Lucrece Louinis and beautiful music by Positively Africa. We will offer a number of programs in conjunction with NSU's 10th annual African Presence exhibit. 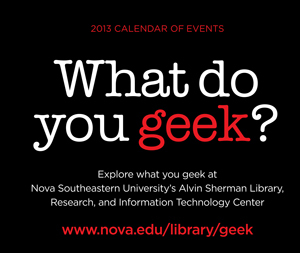 Explore what you geek at the Alvin Sherman Library! February 6 - Positively Africa Concert for Children! February 13 - I Love Books! February 20 - Fables and Folktales! February 27 - Down on the Farm! Enjoy books, songs & activities that enhance early literacy skills and explore the world online with kid-friendly websites recommended by librarians. 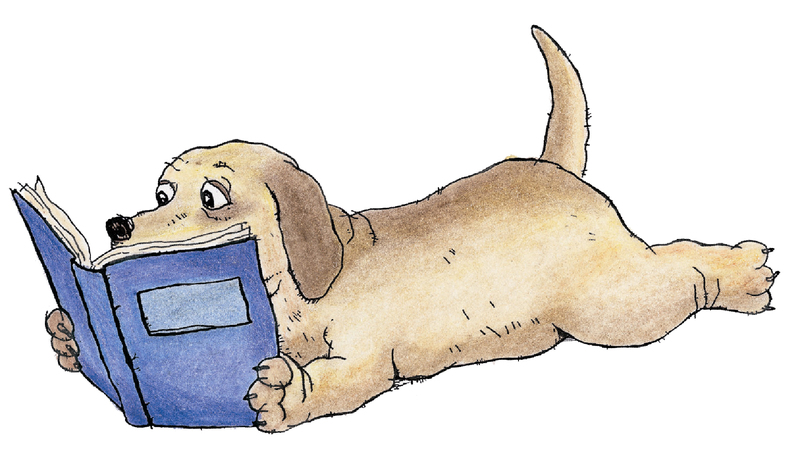 Inspire your future reader with stories and songs featuring rhythm, repetition, and rhyme. Celebrate Black History Month with master storyteller/dancer/singer, Lucrece Louinis. A special story time for children ages 3-5 years who have been diagnosed with Autism Spectrum Disorder Class size is limited. Pre-registration is required. Call 954-262-5477 beginning two weeks prior to the program to register your child. Build and create with the library’s LEGOs. We provide the LEGO blocks – you provide the imagination! This inclusive program for ages 6 and up is for children of all ability levels. Parents are encouraged to bring a camera and take home a picture of your child’s creation. Registration begins on Monday, January 28th. For more information, call 954-262-5477. Do you have a child that loves spending time with animals? Is your child shy or afraid to read out loud in front of others? If you have answered yes, then we have just the program for you! This program enables children between the ages of 5-12 years old to read an age-appropriate short story to an Animal Assisted Therapy Dog. The intent of the program is to make reading fun and boost the child’s confidence in reading out loud. Registration begins on January 2nd. This program is offered in partnership with the Humane Society of Broward County. Registration is required for this program. Call 954-262-5477 for more information. First Floor, Room 1017. The European folktale Little Red Riding Hood is many centuries old and has been reinterpreted by various important writers including Charles Perrault and The Brothers Grimm. Different versions of the tale have been performed on stage and on the silver screen. In this production of Little Red Riding Hood, children will have the opportunity to see the story come to life through the ancient art of puppetry. After the performance, puppeteer Bob Nathanson will give the children a special “behind the scenes” glimpse into the world of puppetry by demonstrating how the puppets were manipulated during the show. First Floor, Room 1017. 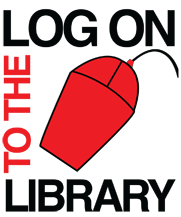 This program is made possible by a gift from the Charles P. Ferro Foundation. Science, Technology, Engineering and Math! Learn about Florida wildlife, local animal rescue efforts and what kids can do to help South Florida’s native critters. Presented by special guests from the South Florida Wildlife Center. Practice sample college admission essays, gain valuable feedback and learn tactics to make your writing stand out! This workshop is facilitated by Dr. Kevin Dvorak, Nova Southeastern University Writing Center Coordinator. Pre-registration required; maximum 25 participants. First Floor, Room 1017. Take a tour led by a NSU Student Ambassador University. Tour classrooms, University Center, Rec Plex and dormitories to get a glimpse of the college lifestyle and experience. Must have signed parental release form to participate. 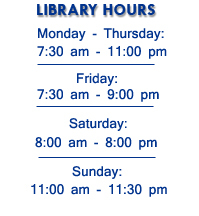 Pick up a form at the Public Library Services Reference Desk on the first floor. Tour meets outside library quad at 12:30pm. First Floor, Room 1017. Meet with the Undergraduate Admissions Department of Nova Southeastern University about specific NSU scholarships available to applicants, as well as the NSU Honors Program and the Razor’s Edge Leadership Program. Participants will also learn how to use NSU’s exclusive Testing and Education Reference Center database to search for a wide array of scholarships and nationwide colleges. 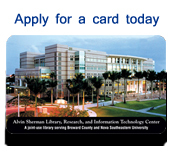 An Alvin Sherman Library card is required for participation. Pre-registration is required. Second Floor, Lab B. Enjoy a feature film for Black History Month and chill in the Teen Room. Call 954-262-5477 for movie title. First Floor, Room 1035. Sculptor, writer, poet and artist, Egyptian born Benoit Menasche offers you an insight into his belief that art is the only constant in civilization. Ben believes that the love and admiration he has for his fellow man, the artists and their art is what makes him a great sculptor and human being. All of these feelings were brought out in his sculpture of the 9/11 Memorial. Second Floor, Cotilla Gallery. Game ON! COF invites you to a Basketball game! The Circle of Friends for the Nova Southeastern University Alvin Sherman Library invites you to a private reception to root for the home team! Men’s basketball game. NSU Sharks VS Lynn University. Complimentary Admission (Reservations required, walk-ins not permitted). RSVP by February 15 to: Joan McBean: 954.262.4627 or libdev@nova.edu. Don Taft University Center Club Room. Celebrate Black History Month! The Broward College Jazz Combo will perform classic jazz songs that are representative of the ‘golden age’ of jazz, from the 1950’s to early 1960’s, marked by jazz greats such as Miles Davis, John Coltrane, and Thelonious Monk. Second Floor, Cotilla Gallery. This class will cover getting online, using search engines, basic terminology, toolbar buttons, and more. Prerequisites: Familiarity with using the mouse and keyboard. Register online or call us at 954-262-5477. Second Floor, Lab B. This computer class is for absolute beginners who would like to learn basic computer skills in a comfortable and welcoming atmosphere. Register online or call us at 954-262-5477. A program by Jane Congdon. Sponsored by the Genealogical Society of Broward County. The Genealogical Society of Broward County’s monthly meeting is held at the Alvin Sherman Library. The program begins at 2:30 pm after the GSBC open lab (12, noon - 2 pm) and the Genealogical Society of Broward County business meeting (which begins at 2 pm). Sponsored by the Genealogical Society of Broward County. Second Floor, Lab A.